This marinade stems from the Peruvian “tiger’s milk” so popular in Peruvian dishes. It is light, sweet, sour and spicy. I like to use it with cooked shrimp. Combine the marinade and add the shrimp (and salmon if used) and other ingredients except for the whole coriander leaves. If using raw fish then marinate at least 2-3 hours otherwise 30 minutes should be enough. Before serving, decorate with coriander. 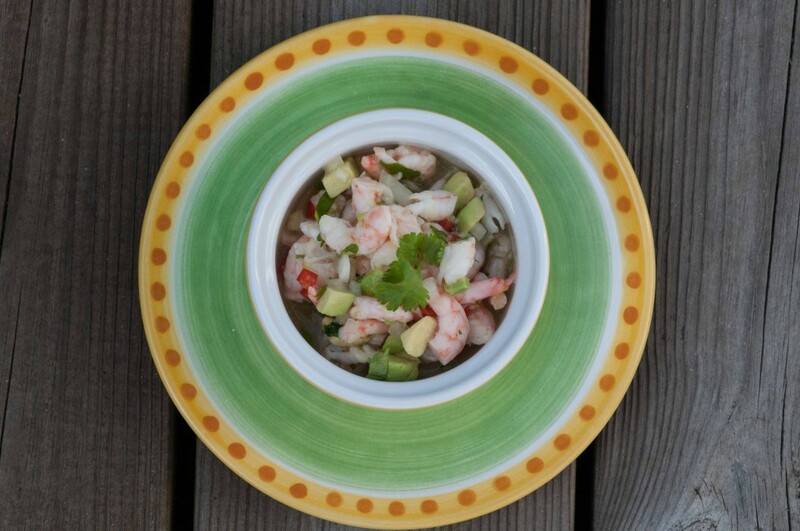 This entry was posted in Friday Shortcut Gourmet, Starter and tagged ceviche, shrimp by EvaH. Bookmark the permalink.